My daughter is really into music. She loves to sing, she loves to dance and she loves to play instruments. I haven’t really bought her any instruments yet (part of me is hoping she might outgrow some of this before I have to get her something really annoying like a drum set) and, while I’ve wanted to get her one of those instruments in a box sets, I haven’t wanted to spend the money on it. So, what do you do? You make your own instruments! My daughter LOVE maracas (I mean, who wouldn’t want something that you can shake and make ridiculously loud music with?? 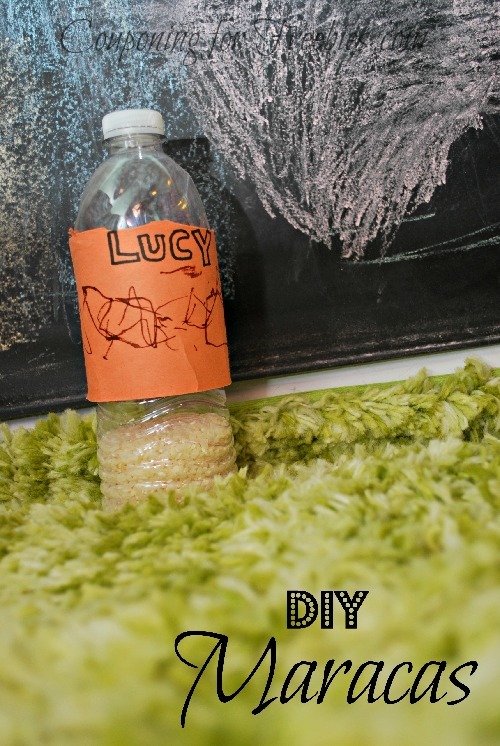 ), and if your child loves them too, you can make them VERY easily and VERY cheaply! And, you can get your kiddo involved with decorating – a win-win! Fill your water bottle with rice about 1/3 of the way full. Or a little less depending on the sound you want it to make. You want to make sure you don’t put too much in so that you can’t shake it well. Cut a strip out of your construction paper or cardstock and let your child go to town decorating it. Let them draw, cover it with stickers or even stamp if they want. The possibilities are endless, and they will LOVE getting to show their creativity and getting to help out with this little project. When your child is done, tape the strip around the bottle. That’s it! It will take you less than 5 minutes (depending on how long your child takes to decorate; mine is always done quickly – she’s a minimalist), and you’ll have a fun instrument for your child to play with! We use Lucy’s ALL the time, especially when we play the Sofia the First song “Make Some Noise”! What better thing is there to make some noise with? ?